The delightful Wee House with it’s private and tranquil location close to the upper reaches of the River Ba, at Knock, is now available as a first class retreat for couples. 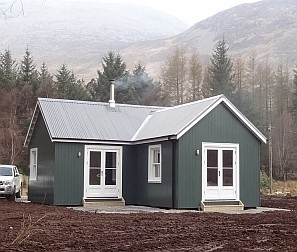 In it’s semi-secluded location nestled amongst the trees and between the River Ba and the hills, the Wee House is only a short walk away from wildlife hotspots Loch Ba and Loch na Keal. Enter through the porch and into the cosy livingroom complete with leather sofa, tv with freesat and woodburning stove. The adjoining kitchen is fully equipped with washing machine, fridge freezer and microwave and to rear of the livingroom the french doors open out onto the enclosed garden. On the patio you can sit back and relax in the magical setting and absorb the countryside views. The bedroom has a double bed with white, crisp cotton bed linen and also boasts french doors opening out into the garden. The separate shower room is complete with WC and bath towels are provided for your comfort and convenience. The Wee House has very efficient insulation and in addition to the woodburning stove there are easily adjustable electric panel heaters in all rooms.